WWDC 2016: Apple previews macOS Sierra with Siri and Apple Pay. Apple today previewed macOS Sierra, a major update to its desktop operating system, with new features. Siri is now on the Mac with brand-new capabilities. With Siri, users can look up information, find documents, pin or drag and drop search results, and even adjust system preferences. Seamless integration with iCloud makes everything from your Desktop and Documents folder available on your iPhone and iPad so you always have access to the files you need. Universal Clipboard allows you to copy content, including text, images, photos and video from one Apple device and paste it in another. 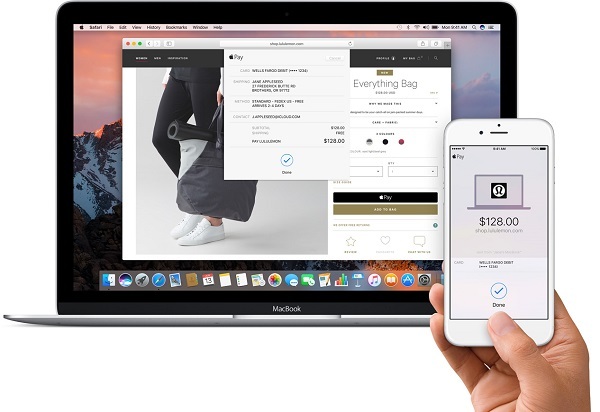 Apple Pay comes to the Mac in Sierra so it is even easier to shop securely and privately online. And Photos now helps you rediscover your meaningful memories, organize your library and perfect shots like a pro. Siri on the Mac is now just one click away. Easily accessible from the Dock, menu bar or keyboard, Siri lets you use your voice to search for information, find files and send messages. For example you can ask Siri to locate a specific document you worked on last night, add a meeting to your calendar or start a FaceTime call. With Siri on the Mac, you can also drag and drop items from Siri search results into your documents or emails, pin Siri search results in Notification Center to keep an eye on information like sports scores or stock prices, and even adjust system preferences, set reminders and search your Photos library. With its debut on Mac, Siri is now on all four Apple software platforms - iOS, macOS, watchOS and tvOS - and handles two billion requests per week across 36 countries. + Auto Unlock lets you simply walk up to your Mac while wearing your authenticated Apple Watch and be automatically logged into your desktop. + Optimized Storage frees up space when your Mac starts getting full by storing infrequently used items in iCloud and reminding you to delete used app installers, and even clearing out duplicate downloads, caches, logs and more. + Messages makes conversations more interesting, now allowing you to preview web links and watch video clips within the app, post reactions like a heart, thumbs up and more directly onto a message bubble with Tapback, and use bigger emoji for more message impact. + Apple Music in iTunes makes it even easier to discover new music and browse exclusives and new releases. The developer preview of macOS Sierra is available to Apple Developer Program members at developer.apple.com starting today. Mac users can sign up for the macOS Sierra Beta Program today and download the software starting in July at beta.apple.com. The final version will be available for free from the Mac App Store this fall. For more information, visit apple.com/macos/sierra-preview.